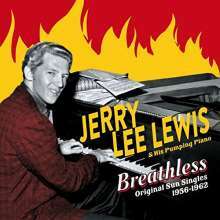 Der Artikel Jerry Lee Lewis: Breathless: Original Sun Singles 1956 - 1962 + Bonus wurde in den Warenkorb gelegt. Jerry Lee Lewis is the first great wild man of rock ‘n’ roll, who embodied its most reckless and high-spirited impulses. During the late ‘50s he combined a ferocious, boogie instrumental style with rowdy, uninhibited vocals to create piano-pounding rockers. Whether singing a melancholy country ballad, a lowdown blues, or a blazing rocker, Lewis’ wholesale commitment to the moment brings forth energetic performances that are totally grounded in his own unique sound. 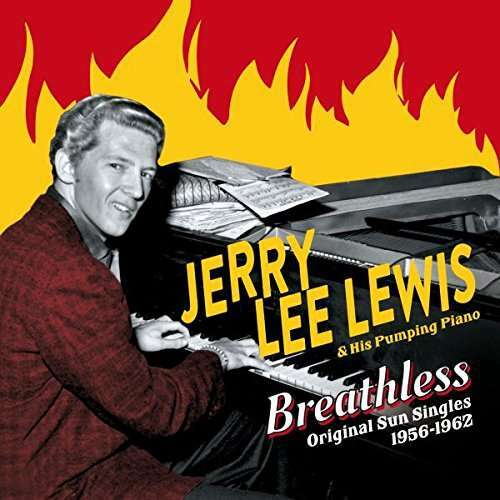 Jerry Lee recorded most of his finest work between the mid ‘50s and the early ‘60s, including hits like »Great Balls of Fire«, »High School Confidential«, »Whole Lot of Shakin’ Going On«, »Breathless«, and »Let’s Talk About Us«, to name just a few. The aforementioned songs, and many others, have been included on this essential 2-CD set, which compiles Lewis’ 7” singles (A & B sides) issued by Sun Records between 1956 and 1962. In addition, this collector’s release contains 9 bonus tracks from the same period. Every effort has been made to replicate the incredible vibrancy of the original Sun material. These simple two-and-a-half-minute songs convey all of the sheer power and emotion of early rock ‘n’ roll.